Learn more about The Caribbean and other countries in our daily postcard e-letter. Simply enter your email address below and we’ll send you a FREE REPORT – The "Hidden", Affordable Caribbean. Mention the word “Caribbean” and most people think of places like Aruba, the Turks and Caicos, the Bahamas, and other tourist-rich dollops of sand. The region conjures well-deserved images of crystal-clear waters and white-sand beaches. And there’s no question: If you like sun and sand, these islands are great for a vacation. But move there? Most folks assume it’s just too expensive and don’t give it another thought. But that’s too bad. Because the Caribbean is bigger than many people realize. And when you look beyond the mass-market shores the tourist brochures describe, you’ll find a variety of sun-splashed islands well worth your attention. They’re not only beautiful… but a lot more affordable than most people realize. Belize, Nicaragua, Honduras, and Mexico all offer islands off their Caribbean coasts—islands that share the same turquoise-blue waters and powder-white beaches you expect when you hear “Caribbean”—only you won’t pay a fortune to live on any of them. English-speaking Ambergris Caye is the largest island in Belize at 25 miles long and a little over a mile wide, and San Pedro is its only town. About 30 years ago, Ambergris became a hotspot for divers and fishermen thanks to the Belize Barrier Reef, just a half-mile offshore. This natural wonderland of living coral supports a dizzying array of marine life, and it’s the main reason Ambergris has seen its recent (and significant) growth. 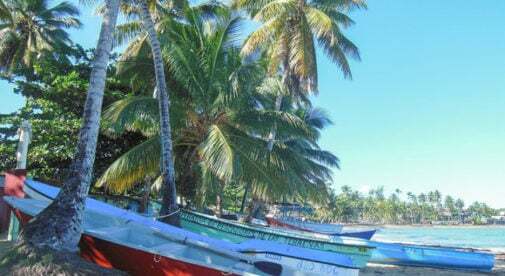 Until just a few years ago, San Pedro was a little fishing village that catered to adventure tourists coming for the scuba-diving and deep-sea fishing. The main motorized transportation on Ambergris Caye at that time was golf carts (which remain popular, though there are many more cars on the island today). San Pedro is now the second-largest town in Belize District with more than 15,000 people, surpassed in size only by the former capital, Belize City. 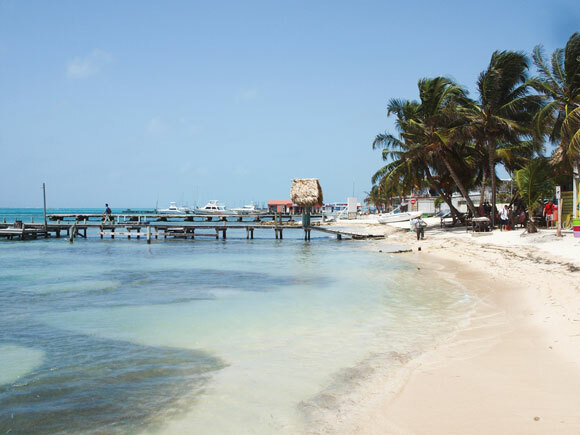 Expats give up little living on Ambergris Caye. Power, water, cell phone coverage, and internet are reliable…and you can buy most necessities for daily living on the island. Regular water taxis and flights make it easy to take a quick shopping trip in Belize City, or Chetumal, Mexico. The selection of quality restaurants and bars is constantly expanding. For between $2,700 and $2,900 per month, a couple can enjoy a comfortable retirement in Ambergris Caye—a budget that includes the cost of a house or apartment rental. If you own your own home on the island outright, then expats report it’s possible for a couple to live quite comfortably on less than $2,000 a month. After years of 16-hour days as owners and operators of a Victorian B&B and cupcake shop in Richmond, Virginia, the easy-going lifestyle of San Pedro is just what Dawn Schick and her husband, Albert, were looking for. And in 2010, they made the move. “We’d been vacationing here several times a year for more than six years and decided this would be our eventual retirement home. But after years of hard work we thought, why wait until ‘someday,’? Why not take the plunge right now?” Dawn explains. Ambergris Caye is no longer a sleepy little Caribbean island hide away. But for expats who prefer to live in an active community that offers both convenience and the natural beauty of the surrounding Caribbean Sea, it has much to offer. An emerald escape in the western Caribbean, Roatán has quietly graduated from secret divers’ getaway to livable island haven. Just 50 square miles, this green, hilly island off Honduras’ northern coast is long and skinny, fringed by a reef rich with sea life and garnished by white-sand beaches. For less than $175,000, you could have a two-bedroom Caribbean home right on the water in a quiet neighborhood with no tourists—your own private getaway. If you stayed just part of the year, you could rent your place out to help cover your holding costs. This is an island where “normal” people can buy a vacation home or permanent digs to live out their sunny, low-cost, and comfortable retirement. The infrastructure is good and getting better all the time, with a new power plant online and the recent opening of a hospital with specialist care and a 24-hour emergency room. Life on an island is often more expensive than mainland living—almost everything has to be imported, after all. 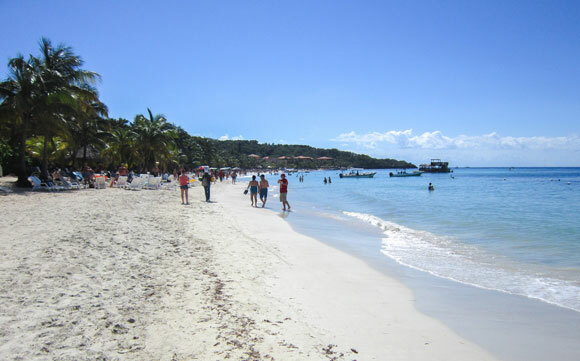 But relative to the rest of the Caribbean, Roatán offers excellent value. The monthly cost of living for a couple, including rent, is $2,000 to $2,500. Ann and her husband Ron have much to be content about. The couple are settled into a three-bedroom house set amid lush vegetation, overlooking the crystal-clear Caribbean Sea. Bottom line: Roatán is great for good-value, laidback living in the sun. Culture vultures will get bored, but if you like to dive, snorkel, swing in a hammock or sit with your feet in the sand, you’ll want to linger. Isla Mujeres is about eight miles from Cancún in Mexico, but this laidback island is a world away from the hustle and bustle of its more tourist-developed older sister. 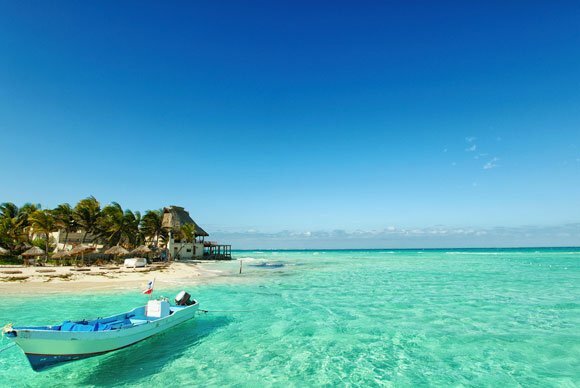 Before Cancún existed, Mexicans and a few adventurous foreigners went to Isla Mujeres for some of the best beaches and water sports in the world—diving for coral, swimming with dolphins, and sailing on a crystal blue sea. Clear, azure waters and white-sand beaches are never far away, and the cost of living is far lower than a similar lifestyle would cost back in the States. You can own a one-bedroom, two-bathroom penthouse condo with a view from $230,000 or rent a one-bedroom place for $700 to $1000 a month, according to local expats. When it was time to retire back in 2008, Lawrie Lock and his wife Lynda drove from their long-time home in Canada’s Okanagan Valley to Isla Mujeres. “We live on the windward side of the island, facing the open ocean,” says Lynda. “That’s where all the action is. We often see pods of dolphins feeding just offshore and sea turtles basking right on the surface. “We’d vacationed on the western side of Mexico for many years. But when we discovered the Caribbean side back in 2002…Wow! The turquoise and green water, fresh sea food, and the friendly islanders here on Isla Mujeres, along with the warm weather, were too much to resist. The island enjoys a warm tropical climate (low to mid-80s F for most of the year) and a laidback vibe; golf carts are preferred to cars as the main means of transport. A couple can live a very nice life on Isla Mujeres for around $36,000 a year, or $2,500-$3,000 a month, including rent. Columbus knew he was on to something good when he spotted a beautiful, coral-rimmed island in 1492. “This is the fairest land under heaven,” the explorer is reported to have said. Though Columbus made many mistakes on his first voyage to the New World, he was right about the island, now known as Hispaniola, the eastern part of which is the Dominican Republic. (The western side is Haiti.) The Dominican Republic has great weather and world-class beaches, not to mention a low cost of living and a stable government—plus it’s just three-and-a-half hours from New York, which means you can leave the city in the morning and be on the beach for lunch. The north coast of the island has some of the finest beaches in the Caribbean, the east coast is a sportsman’s paradise with some of the newest designer golf courses in the region. If you’re looking for a low-key getaway but with all the conveniences of home, you’ll find the town of Las Terrenas offers excellent values with its combination of beautiful beaches, a small-town feel, chic style, and relatively affordable property. Thirty years ago, it was a rustic fishing village. Twenty-four years ago, the town didn’t have an electricity supply. But an influx of 6,000 French and Italians, who loved this place so much they decided to settle here, changed the face of the town. Today, the town center is a whirl of motoconchos (motorcycle taxis), stores and cafés painted rainbow-bright. The original old wooden homes sitting on the beach are now trendy cafés and restaurants. They’re family-run, serving wood-fired pizza and simple snacks, right up to gourmet Italian and French food. This isn’t all-inclusive resort territory, and thanks to strict planning laws it should stay that way. The beach hotels here are small and family-run rather than sprawling, faceless chains. The beaches around Las Terrenas are some of the most pristine in the Dominican Republic. The most incredible thing about it, though, is the real estate prices. A one-bedroom, one-bathroom loft apartment can be had for as little as $99,500. A couple can live in this tropical haven for around $2,000 a month, although most choose to spend closer to $3,000 a month. When Dan Williams decided to retire there, he had been working for eight years as an environmental engineer for the Missouri state government. At the time, he was 57 years old, single, and longed to retire to the beach. After a few months in Sosúa on the north coast of the Dominican Republic, Dan decided to tag along with a friend who was taking a road trip to Las Terrenas. Not many people know that Panama has its own tropical archipelagos. Set on the Caribbean coast, close to the border with Costa Rica, Bocas del Toro is a group of nine main islands and a few hundred smaller cayos and islets, dotting calm turquoise waters. 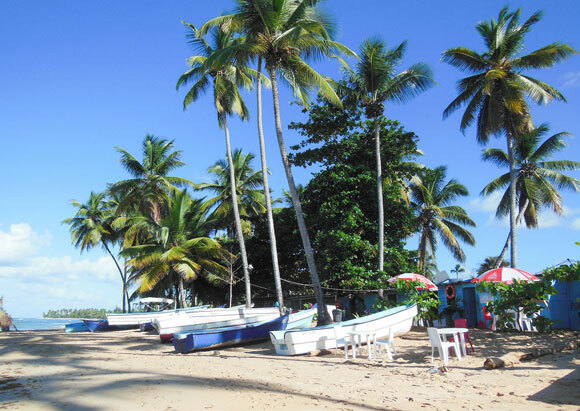 The main hub is bustling Bocas Town, on the large island of Isla Colon. It’s a ramshackle seaside town of brightly painted buildings—many on stilts over the water. It’s the home base for most visitors and where the majority of expats live. 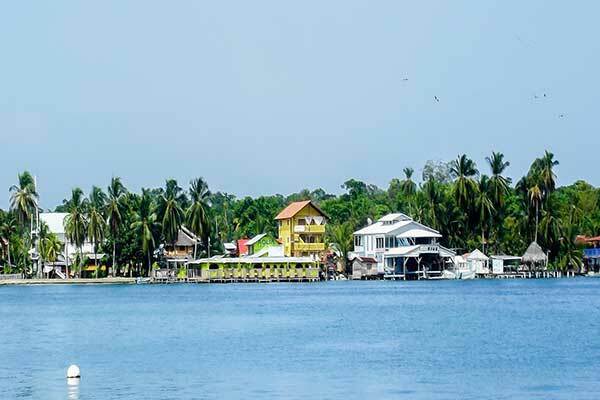 Bocas, as it is known, is all about water. Water sports, fishing, and whale watching are just some of the popular pastimes for locals. The small city is tourist driven but with a laidback feel. Depending on the lifestyle expats choose, a couple can live here on as little as $16,800 a year, or $1,400 a month, renting a simple, snug, island-style home. Bocas is home to a great deal of untitled or right of possession (ROP) property. It’s best to rent and familiarize yourself with the unique landscape before contemplating a property purchase here. Located in the Caribbean, the U.S. Virgin Islands is made up of over 60 islands…most of them uninhabited. The three most populated, and most visited, are St. Thomas, St. John, and St. Croix. The U.S. Virgin Islands are an organized, unincorporated United States territory and their people are U.S. citizens. The appeal of these tropical islands is the mixture of the exotic and the recognizable—an island paradise with modern comforts and a balance of Caribbean culture and American practicality. St. Thomas is the island on which most of the population of the U.S. Virgin Island lives. It is also the most commercialized of the islands and a regular stopping off point for Caribbean cruise ships. This 30-square-mile island has jungle cliffs that soar high into the sky and the turquoise sea is dotted with yachts of all shapes and sizes. 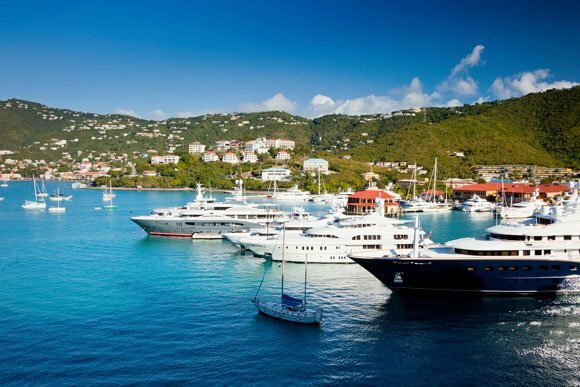 St. Thomas, and in particular the capital of Charlotte Amalie, can get overrun by tourists. While St. Thomas may be a nice place to live, we say “avoid” due to the high cost of living. Apartments rent for about $2,000 a month and to buy a two-bedroom house in a good neighborhood will cost about $285,000-plus. What do Nicolas Cage, Johnny Depp, Oprah Winfrey, Sean Connery, Bill Gates, and Tiger Woods have in common? Apart from being celebrities, they’re among thousands of North Americans and Europeans who own second homes in the Bahamas. Like other expats who live there for all or part of the year, these stars often think of the Bahamas as a paradise—an upscale group of islands with some of the most beautiful beaches in the world. The Bahamas are friendly to newcomers, there’s no foreign language to cope with, crime is relatively low, and the islands are positioned just off the Florida coast. That’s the good news. The bad news is that property on the islands usually isn’t cheap. Medium-size residences in exclusive gated communities with ocean views often cost more than $2 million. Even though Grand Bahama is the closest major Bahamian island to the U.S. (about 55 miles off the Florida coast), it was one of the least developed until only a few decades ago. In the middle of the last century, the population was about 500. 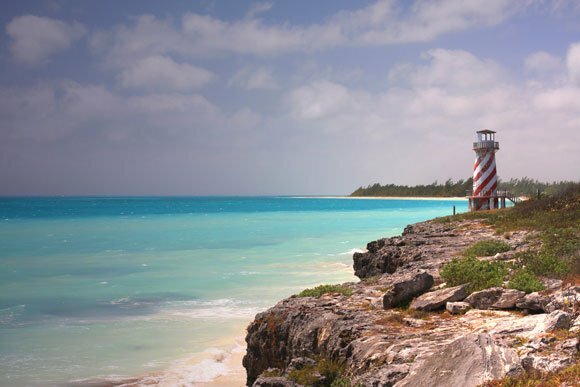 Today Grand Bahama is the second most populous island, with more than 50,000 residents. Its major city, Freeport, has a population of about 27,000, making it the second-largest metropolitan area in the country, far eclipsing West End, the former capital of Grand Bahama. Grand Bahama Island has become a haven for beach-lovers as well as divers, fishermen, golfers, and sports enthusiasts of all kinds. It’s also a prime destination for people who enjoy world-class shopping. But living here costs a premium as it’s between 30% and 50% more expensive than in the U.S.